Baynes, Robert Hall, M.A., s. of the Rev. Joseph Baynes, b. at Wellington, Somerset, Mar. 10, 1831, and educated at St. Edmund Hall, Oxford, graduating B.A. 1856, and M.A. 1859. Ordained in 1855, he held successively the Curacy of Christ Church, Blackfriars, the P. Curacy of St. Paul's, Whitechapel; of Holy Trinity, Maidstone, and of St. Michael's, Coventry. In 1870 he was Bp. designate of Madagascar; but resigned in 1871. In 1873 he was appointed Hon. Canon of Worcester Cathedral, and in 1880 Vicar of Holy Trinity, Folkestone. Canon Baynes is more widely known as the compiler of some most successful books of sacred poetry than as an original hymn-writer, although some of his hymns are of considerable merit, and are in extensive use. Of these the best known are “Jesu, to Thy table led," and "Holy Spirit, Lord of glory." 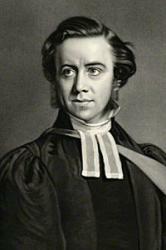 He was editor of Lyra Anglicana, 1862; English Lyrics, 1865; The Canterbury Hymnal, 1864 ; and the Supp. Hymnal, 1869 (all pub. Lond., Houlston & Wright); The Illustrated Book of Sacred Poems, Lond., Cassell & Co., and is the author of original Autumn Memories and other Verses, Lond., Houlston & Wright, 1869. His hymns appeared in The Canterbury Hymnal, the Autumn Memories, and in the Churchman’s Shilling Magazine, of which he was sometime editor. His Home Songs for Quiet Hours were pub. in 1878, and Hymns for Home Mission Services in the Church of England, 1879. To his eucharistic manual, At the Communion Time, a series of hymns for Holy Communion are added. D. March 12, 1895.
i. In his Canterbury Hymnal, 1863. 1. Bend every knee at Jesus' name. Missions. ii. In Mrs. Brock's Children's Hymn Book, 1881. 2. God Almighty, in Thy temple. Holy Trinity. This begins in his Hymns & Other Verses, 1887, "God Almighty, Heavenly Father." 3. Lord Jesu! on our forehead. Confirmation. 4. 'Neath the stars which shone so bright. Christmas Carol. 5. No room within the dwelling. Christmas. 6. O Man of Sorrows, Who didst die to save. Death and Burial. iii. In A. J. Soden's Universal Hymn Book, 1885. 7. Great Shepherd of Thy ransomed flock. Holy Communion. 8. Jesu, Thou true and living Bread. Holy Communion. 9. The day is done; beside the sultry shore. Evening. Eternity. Of these hymns, Nos. 2, 4, 5, 7, 8, 9, are in Canon Baynes's Hymns and Other Verses, 1887. There are also others in the same work which are worthy of notice, especially one for a Flower Service, written in 1885, “Lord Jesu! we adore Thee."